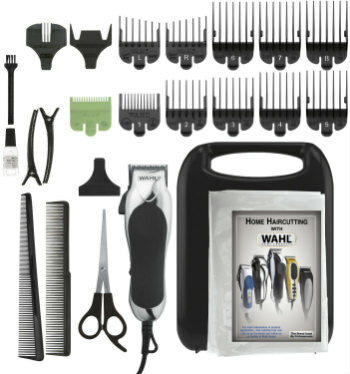 If you need special clippers to trim your scalp hair, the Wahl Chrome Pro Haircut Kit #79524-2501 will allow you to save money from having to go to the barber shop. 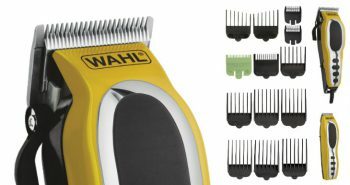 These Wahl hair clippers cost under $22, making them a great deal, particularly with all the accessories included in the box. 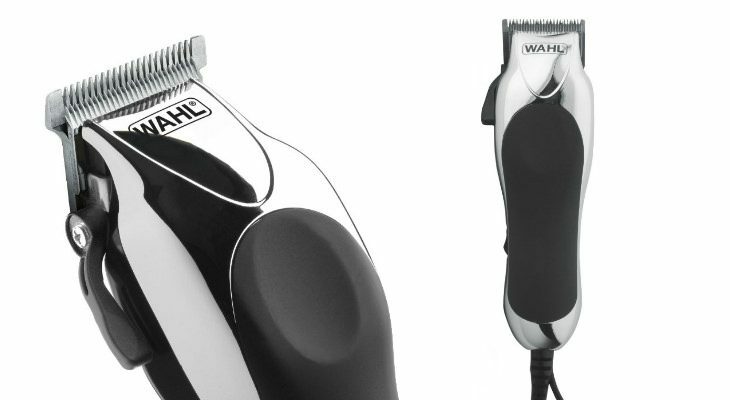 There are twenty-four pieces included in the Wahl Chrome Pro haircut kit. These clippers come in a light silver and black body casing and are reminiscent of a retro-barbershop look with its Dura Chrome finish. You can use these clippers to trim hair from the top of your head to the tops of your toes. You can use it for total body grooming for the entire family. You’ll find that many professional cyclists, swimmers, and other athletes use the Wahl Chrome Pro. Because of this, Wahl is earning more notice in the consumer market. This kit will enable you to save tons of money from having to visit the barber shop every three or four weeks. All that money can add up over time. This kit is inexpensive and now you’ll be able to think how else you can spend the hundreds of dollars you’ll now be saving each year. You can even save more money by using the Wahl Chrome Pro kit to trim the hair of everyone in your whole family. This kit will enable you to give your whole family professional looking haircuts quickly and easily. 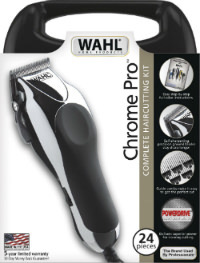 The Wahl Chrome Pro have been built with a high-speed PowerDrive motor. This motor is capable of giving a smoother cut even if hair is thick and tough. Despite this high power, you’ll find that the clippers are lightweight, and the motor isn’t too noisy. 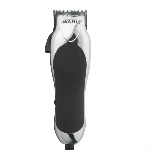 These clippers are powerful enough to use for giving a crew cut or maintaining a shorter hairstyle. You’ll also be able to comfortably hold the clippers easily in your hands as it has a nice grip. Your hand won’t tire easily, enabling you to fully complete your desired hairstyle. There is an on/off switch located on the front middle of the clippers. You can easily turn it on or off with a button. For the ten adjustable guide combs you’ll need to use a thumb-operated switch on the front of the clippers, which allows you to easily adjust the combs to the desired hair length that you want. The blades built within the Wahl Chrome Pro clippers are self-sharpening, making the shaver blades last for a very long time. Each blade is made from high-carbon steel that is designed to last for longer, and stay sharp for longer. These blades have also been permanently aligned, so they will never need to be adjusted. There are no replacement blades at this price point, so should your blades become dull over time, you’re looking at buying an entirely brand new set of clippers. For $22, you may wish to purchase more than one, so you always have a backup set at hand. It’s simple to clean your Wahl Chrome Pro Haircut Kit #79524-2501. The internal blades actually pop out so you can give them a thorough cleaning. You’ll want to make sure you dry them thoroughly, as these clippers are not for wet usage, nor are they waterproof. In the box you’ll receive one Wahl multi-cut hair clippers, a blade guard to protect the top of your clippers, scissors, a variety of attachments for the clippers and instructions. You’ll get the barber comb, a styling comb, two hair clips, a cleaning brush, a zippered pouch, blade oil to keep your clippers in optimum working order, a cape, eyebrow trim guide comb, ear trim guide comb, and eleven other guide combs. Most of the combs and attachments are black, while one is in lime green. The entire kit also comes in a convenient black durable storage carrying case with handle. There is also an instructional video that comes in full colour English, and full colour Spanish. 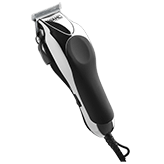 The only downfall for this shaver is that it is designed for USA electrical outlets only, and does not come with international travel voltage selection. 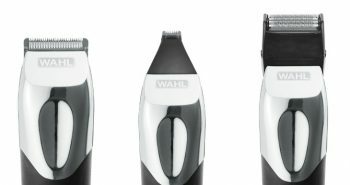 The Wahl Chrome Pro Haircut Kit #79524-2501 is backed up by a five year limited warranty, so if you’re worried about buying cheap clippers, you can be assured that these are good quality hair clippers. The manufacturer backs them up by providing a warranty for them being free from defects. 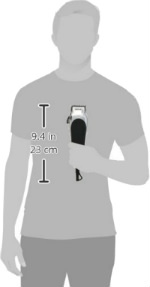 The entire Wahl kit measures 9” x 2.4” by 1.8 inches, and weighs 1.8 pounds. The cord is black and rounded. This shaver is only for dry usage and is not rechargeable or cordless. 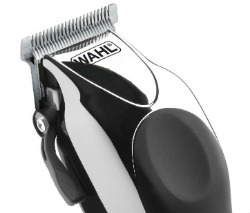 The ratings are quite high on this Wahl kit, around 4.3 out of 5 stars. Most people are pleased with their purchase. If you’re on a tight budget, you may want to purchase your own Wahl Chrome Pro to trim you and your family’s hair at home. There are a variety of attachments, so you can trim hair to a variety of different lengths so not everyone will look the same. This is also a great option over some of the cheaper hair clippers that cost under $10, and aren’t as reliable. The Wahl brand is well-known and respected. While there have been some reviews of defective trimmers, the five year warranty will ensure that your Wahl Chrome Pro will be replaced, should anything be wrong with them.